Everyone has been writing about Windows 10, and while a lot of it is click-bait, there is also a lot of good information. If you haven’t got a license for Windows 10 yet, I do recommend getting one as soon as you can. Process Lasso looks and runs great, of course! Bugs in the Win10 pre-releases are gone. No explorer crashes, in particular. It seems to install very well over-top Windows 8.1. Better than any previous over-top installation I’ve seen. One caveat is that if you use TrueCrypt system volume encryption, you should remove it *first*, then restore it afterwards. However, even if things go wrong due to that complication (or another), the install process leaves Windows 8 perfectly in-tact. The new desktop-centric experience is not only a welcome relief from Windows 8, but is dramatically improved in appearance and functionality. The boot, shut-down, logon/logoff speeds seem substantially faster than even Windows 8. Driver support seems broad, though you should definitely check your PC manufacturer’s web site to see if they have any newer drivers (or obviously if you end up with missing drivers). For the most part, the NT kernel architecture is the same as Windows 8, thus driver compatibility shouldn’t be an issue for many devices, if any. Worst case scenario of some obscure hardware vendor that doesn’t maintain their drivers is that you have to hack the INF to force the driver to install in Windows 10. I’m very pleased, and very excited! 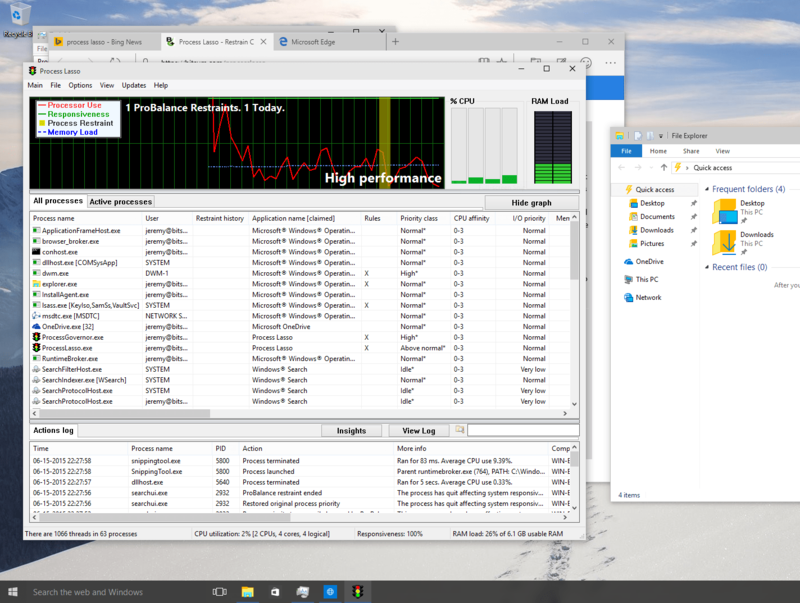 At Bitsum, our primary machines are now all running Windows 10 Pro, including our development environment VM.